The Ireland rink of Sile Garvey, Sarah-Jane Curran, Aaron Tennant and Stuart Bennett again enhanced the country’s reputation by returning from the European Bowls Union Championships in Israel with a bronze medal! England may have won the overall team event, but there was no hiding the Irish joy with their latest success on foreign soil - the tournament was staged at the Ra’anana and Ramat Gan Bowls Clubs. Ireland boss Jim Baker saluted the performance of a team that once again held its own in the company of some of the world’s top performers. “We proved again that we are a match for the big nations,” said Baker, the outdoor men’s international team boss. “Make no mistake about it, the quality of the opposition cannot be hyped up enough. “It’s not the case of punching above our weight because we have a proud record at bringing home medals from all the top tournaments, including the World Championships and Commonwealth Games. Three disciplines dominated the European Championships - men’s pairs; ladies pairs and mixed rinks. Unfortunately, Tennant and Bennett didn’t have a lot to celebrate in the former, which was won by Guernsey’s Matthew Solway and Matthew Le Ber . . . disappointingly, the Irish lads finished in the bottom half of the table. Jersey’s Derek Boswell and Cyril Renoif defied the odds to pick up a silver medal, while England’s Ashley Carees and Alex Walton took bronze. Garvey and Curran fared much better in the ladies pairs, claiming a mid-table position. However, it was gold for Amy Stanton and Rebecca Field, of England. Surprisingly, Saskia Schaft and Norma Duin, from the Netherlands, took silver ahead of Guernsey’s Jackie Nicolle and Lucy Beere. But the Irish upped the ante in the Mixed Fours. They were placed in a tough section that included Wales, Jersey and Guernsey, but still managed to claim a bronze medal in the overall table. It was not a total surprise when England’s Rebecca Field, Amy Stanton, Ashley Carees and Alex Walton struck gold with 18 points, as they were included in a weaker group that included Spain, Netherlands, Cyprus and Switzerland. Guernsey (Nicholle, Beere, Solway and Le Ber) edged into second place only one point behind, but Ireland can certainly take a great deal of satisfaction with their third place finish -- again they were only one point adrift. “When you take into consideration that they finished ahead of the host country; Wales and Jersey in the 12 team tournament, it must go down as another positive performance,” added Baker. Mixed pairs results: Ireland v Wales 10-9, 11-4; Ireland v Germany 26-0, 17-3; Ireland v Guernsey 9-9, 17-3; Ireland v Jersey 10-8; 10-10; Ireland v Isle of Man 8-5, 12-1. * Sean and Martin Trainor walked off with the top prize in the County Indoor Bowls Club’s Short Mat pairs tournament that reeled in another top entry at Parkgate. The Portadown boys scythed through group stages and, after holding their nerve in the knockout phase, they defeated Aidan Corrigan 10-6 in the final. 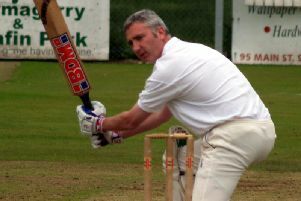 “It was another fantastic three days of bowling,” said County Antrim manager Rod Coleman. “The ‘house full’ signs were up for the two nights of qualifying. Knockout scores: S Quinn 12 E Hastings 3; S McGlinchy 6 I Hobson 9; M Trainor 7 A McCombe 6; C Wylie 6 J Richardson 7; E Crawford 3 C Beattie 8; P Beattie 6 N Haire 7; A Corrigan 13 M Beattie 8. Quarter finals: Quinn 9 Irwin 5; Hobson 12 Beattie 3; Trainor 7 Richardson 6; Corrigan 9 Haire 6. Semi finals: Quinn 2 Corrigan 9; Hobson 4 Trainor 10. Final: Corrigan 6 Trainor 10. * Entries are now invited Woods Bowling Club’s (Mid Ulster Zone) Open Pairs tournament that will be staged from Monday-Thursday, October 26-29, inclusive. Finals night is scheduled for Monday, November 2. Entry fee is £5 per pair. Please contact tournament secretary: Rae Patterson on 028 79469797 for details.